In supersession of orders issued in the reference eighth read above, the Government hereby issue following guidelines for transfer of employees for 2018. 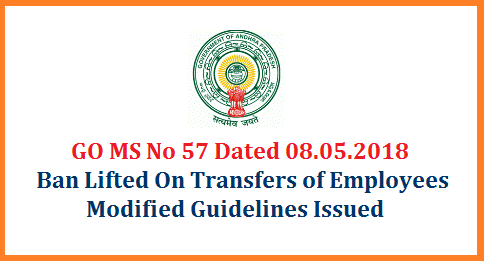 The existing ban on transfer of employees imposed vide reference 5th cited is relaxed for the period from 5th May, 2018 to 4th June, 2018 to ensure right placement of employees to secure optimum productivity and commitment to furtherance of Government’s development objectives. Transfers shall be effected only on the following grounds. Employees seeking transfer on these grounds shall have completed three years of continuous service as on 1st May,2018 in all cadres at the present station. Station means place (City, Town, Village) of actual working for the purpose of transfers and not office or institution. Transfers on request shall be considered by the competent authority only against an existing clear vacancy. In case of mutual transfers, both the employees seeking transfer on mutual grounds shall have completed three (3) years of service as on 1st May,2018 at their present respective stations. Transfers on mutual grounds or request grounds shall not be done between the offices located in same station.